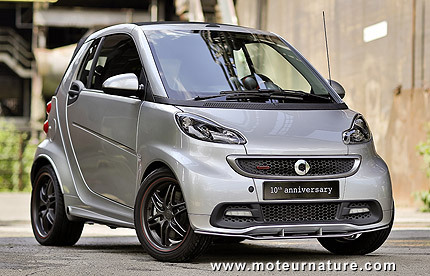 Some people laughed in June 2002, when Smart introduced a Brabus version of its little car. Brabus, the German tuner mostly known for its Rocket V12 200mph+ super sedans, could it be possible that this company do something on a little Smart? Could such a little car be sporty? Well, it was certainly possible, with the result being a faster (102 hp), more luxurious and more expensive Smart. Some people liked it. More than 50,000 have been sold so far. Non-believers were wrong, there are definitely buyers for a luxury micro-car. The Smart Brabus costs more than a base Ford Focus, but if offers a choice of 30 different colors for its leather interior (at extra cost). 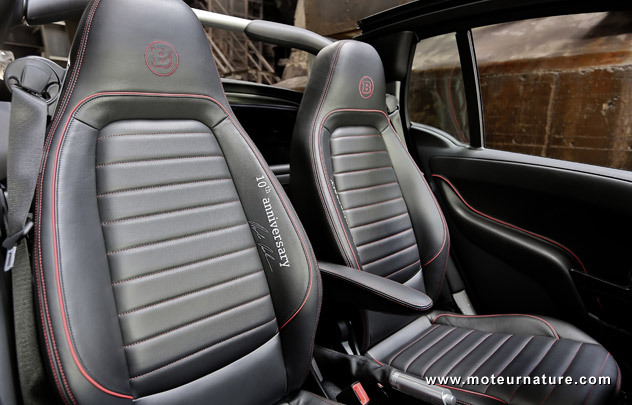 Smart and Brabus will commemorate their 10 years of collaboration with a special model, a 10th anniversary edition, complete with a super shiny paint, and a black leather interior with contrasting red stitching. It should prove popular, next to the new electric model (which I wrote about here), and probably more than ever before, considering sales are on the rise. More than 10,000 Smart Brabus were sold last year. That was the record year, but that could that be beaten this year. Unless there’s at least a nuclear war, we know that traffic congestion will not get any better in Europe’s big cities. The market for luxury small cars can only grow.